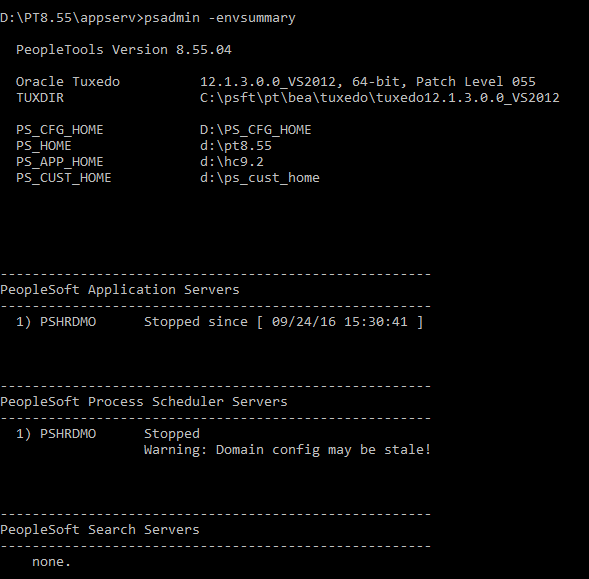 PeopleSoft psadmin utility is used to administer PS App server , process scheduler and web server domains. There are set menu options that you can use to administer or configure any of the above mentioned components. To use any option, you simply enter the value on the psadmin menu and proceed with your task. But there is also a hidden option which is not visible in psadmin menu but when you enter that option, you get a specific output. 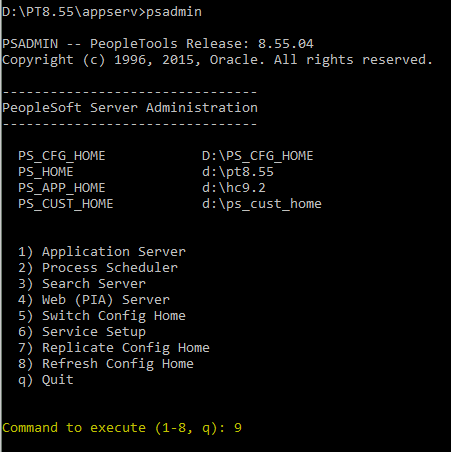 When you invoke psadmin, you are shown PS Server Admin menu with different options to administer different PS components. 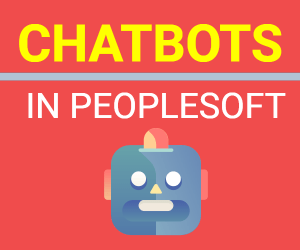 Total number of options can vary depending on PeopleTools version. How to invoke secret option in psadmin? To invoke secret menu , simply enter a value which is +1 of last option in server admin menu. for e.g. For PeopleTools 8.55, there are 8 options for you to enter (excluding ‘q’). Now if you enter 9 (i.e. 8+1) , then you will be able to invoke this secret option. 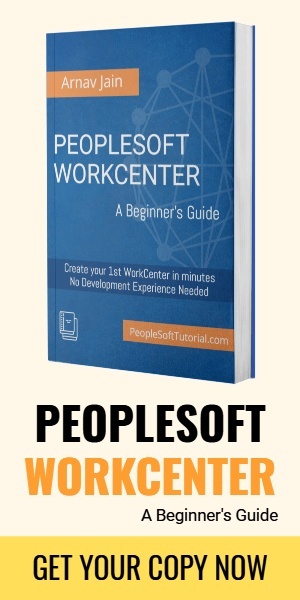 psadmin utility won’t throw any error with invalid option, instead will show the PeopleSoft environment configuration. 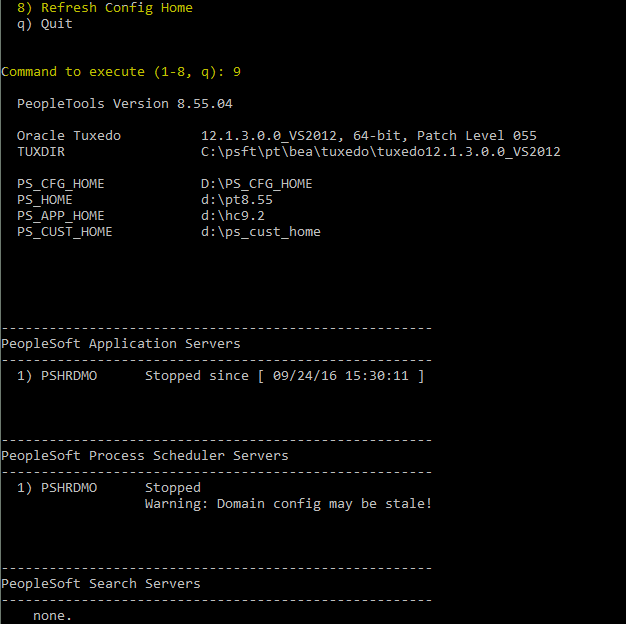 This PS environment configuration will include details of Oracle Tuxedo, TUXDIR, status of your server domains. Though this option #9 is not visible on psadmin menu but it was always accessible using command line interface. You can use following command to get to the same information. Output shown is exactly the same which was shown on hidden option. Hope you find this trick helpful.